By Jr. Ph. D. James B. Morris, Jeremy S. Gaies Psy D.
Createspace Independent Publishing Platform, 9781499677522, 142pp. 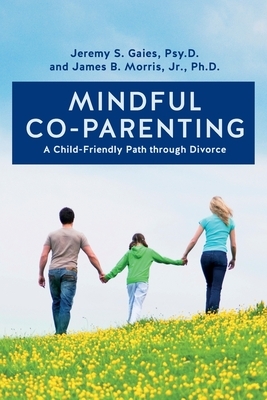 Mindful Co-Parenting provides divorced parents a practical way through the process that protects their children. In this compact, step-by-step guide, written in a supportive yet direct style, clinical psychologists Jeremy S. Gaies, Psy.D., and James B. Morris Jr., Ph.D., identify what matters most to kids and describe the importance of parents being mindful of their children's needs and wants. Starting with the question of whether or not divorce is the best option for your family, the book walks you through the process, from choosing the most child-friendly divorce proceedings, to navigating co-parenting after the papers are signed, to handling the future challenges of stepparenting and other issues that may arise. Jeremy S. Gaies, Psy.D., is a clinical psychologist and family mediator who works in private practice in Tampa, Florida. He earned his undergraduate degree from Brown University and his graduate degree from Rutgers University. Dr. Gaies works with parents raising their children together after a divorce, guiding them to create more peaceful family relationships. James B. Morris Jr., Ph.D., is a clinical and forensic psychologist who works in private practice in both Clearwater and Tampa, Florida. He earned his undergraduate degree from Florida State University and his graduate degree from the University of South Florida. Dr. Morris specializes in helping parents navigate the process of divorce and co-parenting and in conducting parenting plan evaluations. Together they wrote the guidebook Mindful Co-Parenting in an effort to help divorcing parents better protect their children as they move forward in their lives.